NEW DELHI, 26 August, 2015. Noida-based global EPC company Nuberg Engineering announced today that it has landed an INR 1000 cr contract to set up a USD 150 million chemical complex for UAE's leading industrial conglomerate, the Abu Dhabi based Al Ghaith Industries. This will be Nuberg's biggest contract till date in its 19 year history. The complex will have two phases. In the first phase, 350 TPD Caustic Soda and 60 TPD Hydrogen Peroxide Plants is set to come up at the Khalifa Industrial Zone (Kizad) in Abu Dhabi. 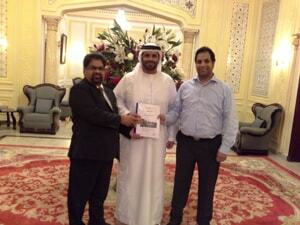 The completion of the project will make Al Ghaith Industries the largest manufacturer of caustic soda in the UAE. It will also make Nuberg the largest EPC company in UAE for the Chlor Alkali industry, having done three out of the four Chlor Alkali projects in the UAE already. Expressing his delight at winning the deal, Mr. AK Tyagi, MD, Nuberg Engineering, said, "This is an overwhelming endorsement of Nuberg's leadership in the EPC space for chemical process plants. We are grateful to the Al Ghaith Industries leadership for continuing to repose faith in our abilities to provide world class EPC services. This historic day in Nuberg's two decade old history is sure to act as a catalyst to help us reach new heights of excellence and innovation." Mr. Ali Hamel, Chairman, Al Ghaith Industries also shared his happiness with the partnership saying, "We are proud to announce another strategic EPC project which would further boost UAE's economy. This major project is a leap of growth towards becoming the pivotal catalyst for the Chlor Alkali industry in the MENA (Middle East North Africa) region. It will enable us to become the leader in catering to the increased demand for Caustic Soda in the Middle East and Africa as well as create new market opportunities. Nuberg Engineering is our long term engineering partner and we are extremely satisfied with the organization's depth and breadth in the engineering domain, commitment to on-time deliver y of projects and their technological capabilities. This is our fourth consecutive project with Nuberg. The company is always ahead of the pack and has a proven track record, thereby, making it a rational decision to partner with one of the most trusted EPC companies." This would be Nuberg's fourth consecutive EPC project for Al Ghaith. The first of which is set to be commissioned in September 2015. Its first Chlor alkali project with Al Ghaith involved a 140TPD capacity plant while the second signed in October last year was also for a similar capacity. The third project involved the execution of a Calcium Chloride EPC contract. This, the fourth and Nuberg's third Chlor alkali EPC deal with Al Ghaith, will easily be the largest. The majority of the equipment for the project will be built and exported from Nuberg's 115000 sqm state-of-the-art manufacturing facility in Jhagadia near Ankeleshwar in Gujarat.